The Club's post code is IP28 6HX. From the Bury St Edmunds West interchange on the A14, take the B1106 to Fornham All Saints mini-roundabouts (or, from Bury itself, take the A1101 towards Mildenhall from the Tollgate Lane traffic lights, which will bring you to the same mini-roundabouts). From here, continue on the A1101 North-West through Hengrave and Flempton. 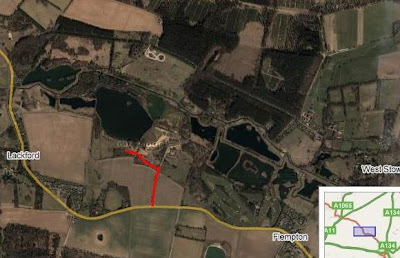 After Flempton (and its golf course), take the first right turn signposted "Lackford Lakes - Nature Reserve". This turning is just after the warnings for the traffic calming in Lackford. Then take the left turn off this gravel track through the gates to the sailing club.